A superhero and masked hero naming convention where the hero has a color as part of their name. Generally, this color is incorporated into their powers, their appearance, or their costume in some way. Expect it to be pointed out if it isn't. Most names of this type take the form of Color Noun. A Sister Trope to Something Person, where the hero or villain has his power or defining trait as part of his code name. May or may not be Color-Coded for Your Convenience. Wanders into Added Alliterative Appeal on occasion. Different colors tend to signify different things. A few of these characters are from the Cold War era and are colored red because they come from, or represent, a communist nation. Black can indicate a Captain Ethnic or an Anti-Hero. See also Colourful Theme Naming, All Your Colors Combined. Pink Starlight - M9 Girls! Red Riot - Eijirou Kirishima's hero name in My Hero Academia. Name inspired by Crimson Riot, who also counts. Red Dragon of Earth-8 as identified by The Multiversity Guidebook #1. There's also a Red Raven in DC Comics, a member of the International Club of Heroes. Tim Drake is now Red Robin in the main DCU. Red Jaguar - Halt Evil Doer! Ruby Dragon, from the same series. The Green Lanterns - Green Lantern. However, the mythology has expanded so that the franchise now fits under "Spectrum", below. The Lady of the Green Kirtle - The Chronicles of Narnia. Sometimes also called the Green/Emerald Witch. Blue Rajah - Mystery Men. His costume has little to no blue in it, which is Lampshaded at least once. The Blue Meanies - Yellow Submarine. While Blue Senturion from Power Rangers Turbo is an example of this, his Sentai counterpart, Signalman, isn't. On Smallville, the media begins referring to Clark Kent's superhero identity, not as Superman, but as the "Blue Blur" (or "the red-and-blue blur," or just "the Blur"). Blue Destiny - M9 Girls! Purple Space - M9 Girls! Black Batman (a Hong Kong comics knockoff of Batman). Flying Black Batman (a Hong Kong comics knockoff of Batman). Super Black Conqueror (a Hong Kong comics knockoff of Martian Manhunter). Blackadder was originally this, until his descendants adopted it as their family name. The Black Raven - Wakfu (actually lampshaded). Black Siren - Justice Guild member on Justice League. Black Lightning - Black Lightning. Though it was later Ret Conned so that his lightning itself is black, which is supposedly the source of his name. Played with by White Wolf, who got his name for the same racial reasons as the various "Black" heroes listed here; but he's a white man in a majority-black country instead of the other way around. Averted in Spinnerette: Tiger is a large black super hero, but his name is just "Tiger". The reason this comes up is because everyone always calls him "Black Tiger". The Grey Lady, Fenrir Greyback - Harry Potter. Though the latter may just be a fitting surname. Grey Ghost - Batman: The Animated Series. Grey Matter - Ben 10. In these two cases, they do have true Kamen Rider names, but are called by these In Series Nicknames. White Energy - M9 Girls! A form of Theme Naming when most or all of the cast is named after colors. The Red Ribbon Army from Dragon Ball. The title characters from Action Heroine Cheer Fruits have Colorful Theme Naming, but on top of that the characters they play in their stage shows all have color-themed names like Medica Red, Deep Purple, Platinum, etc. Green Lantern's Alternate Company Equivalent from the Squadron Supreme is actually called Doctor Spectrum. 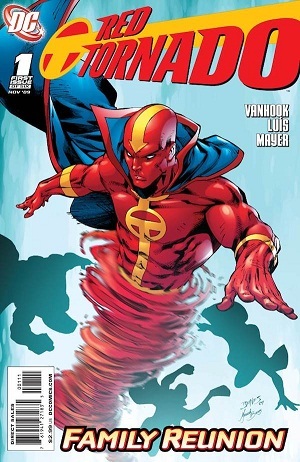 Red Tornado of DC Comics now has several other color counterparts. Rainbow Triumph - Soon I Will Be Invincible. Power Rangers and Super Sentai. Note, though, that Sixth Rangers often have their own non-color codename. There have been a few times in Super Sentai where the heroes, while still all wearing different color suits, weren't codenamed for them, such as Kyoryu Sentai Zyuranger and Gosei Sentai Dairanger where they were called things like "Tyranno Ranger" or "Shishi Ranger". Captain Scarlet and the Mysterons: the organisation is even known as Spectrum. Disgaea has the Prism Rangers, themselves a parody of Power Rangers and Super Sentai. The Yakumos have a colour theme doubled with Bilingual Bonus - namely, Chen means orange, Ran means indigo and Yukari means violet. This gets VERY meaningful - Yukari is the most powerful of the 3, Chen is the weakest, and THAT'S just the game of their introduction. In the 8th game, Yukari is half of the border team, the other half being the predominantly red-wearing Reimu, making the team name very meaningful. Main heroes of The Wonderful 101 are Wonder-Red, Wonder-Blue, Wonder-Green and so on. The Squirrel Girls in Sequential Art. In the Whateley Universe stories about Silver Ghost, she gets involved with SPECTRUM, the superhero group of Cincinnati. They have theme naming (Green Witch, Yellow Knight, Azure, etc), which really ticks off Tawny - she'd rather have a name like Lioness. In the Global Guardians PBEM Universe, Spectrum is a terrorist organization. There's also the Iron Legion, a group of Powered Armor mercenaries whose code names (and armor) are Color-Coded for Your Convenience...Red, Orange, Yellow, Green, Blue, Indigo, and Violet all wear armors in colors that match their names. The White Legion, a group of white-supremacist superheroes. All of them have "white" in their names. This trope is referenced in Larry Boy and the Angry Eyebrows when we meet "The Scarlet Tomato" as it only works when you name yourself after the color that that object or animal is not.